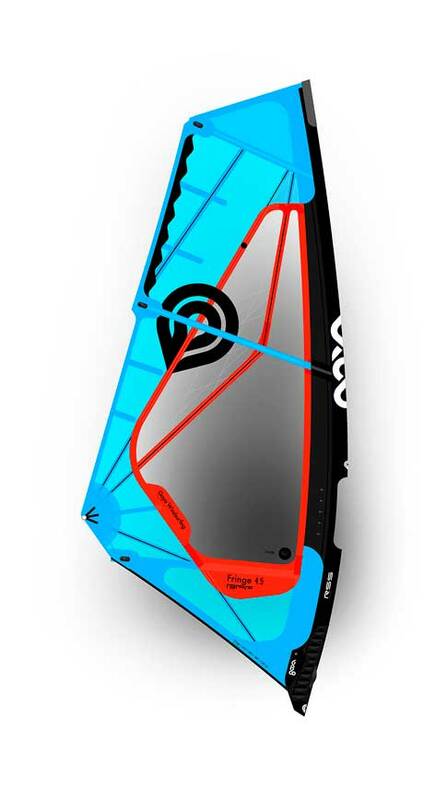 The Fringe is our super light, minimalist wave sail featuring feather light handling, progressive maneuverability, low-end power and high wind control. A year of development has made a big difference in the overall handling characteristics of the Fringe. The primary design objective was to improve the handling of the sail in stronger wind. We have achieved that goal with outline refinements, particularly making the sail just a little bit shorter, then adding a bit more head outline. Alongside the necessary shape and luff curve adjustments needed to match the new outline, this led us to a new sail that has big improvements in basic maneuverability. The new Fringe turns immensely more tight and controlled. New window shapes increase the viewing area. The updated the material in the tack of the sail, equip the Fringe with the new damage protection and increased visual impact. 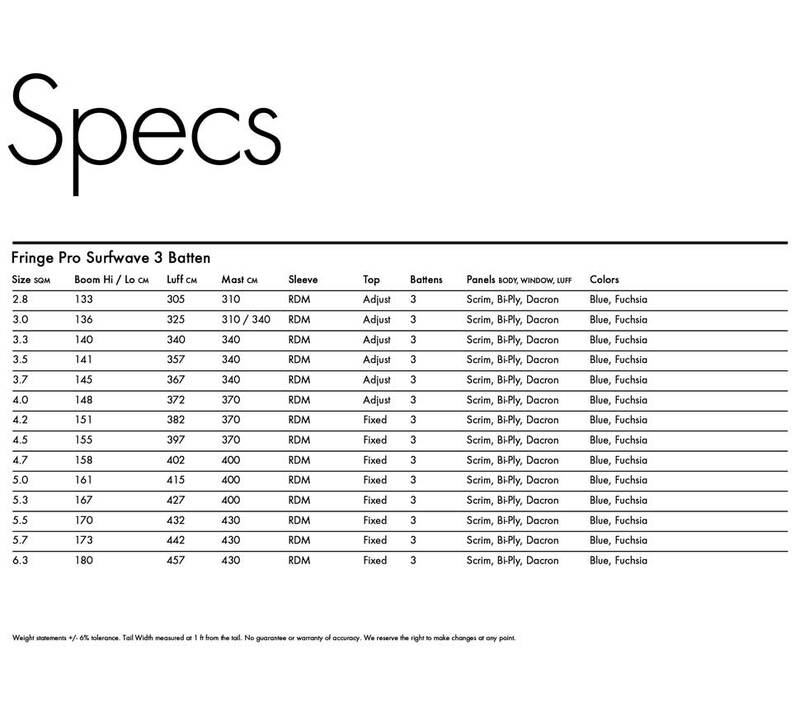 On top of being the supreme surfwave sail, due to their amazingly light weight, the bigger sizes of the Fringe pair well with foil boards such as the Bolt or Proton. Available in blue & red or fuchsia & yellow. Recommended wave mast 90 Pro. Dacron luff panels, Carbon Stretch Control, Titanium Clew Ring, Rip Stop Sleeve and a Molded Tack Fairing round off the peak quality package. Sleeve cut treatments as well as tack and foot reinforcements are now folded to increase durability and prevent edge fraying. A wider scalloped upper leech reinforcement prevents breakdown of the leech from fluttering in strong wind conditions such as Omaezaki, the Gorge and Pozo. So far I had just great feedback for the Banzais and Fringes, Banzais feeling a bit softer (due to decreased mast length I guess) and the Fringes more stable and therefore having a bigger range. Thanks again for all the love and help through out the years!! 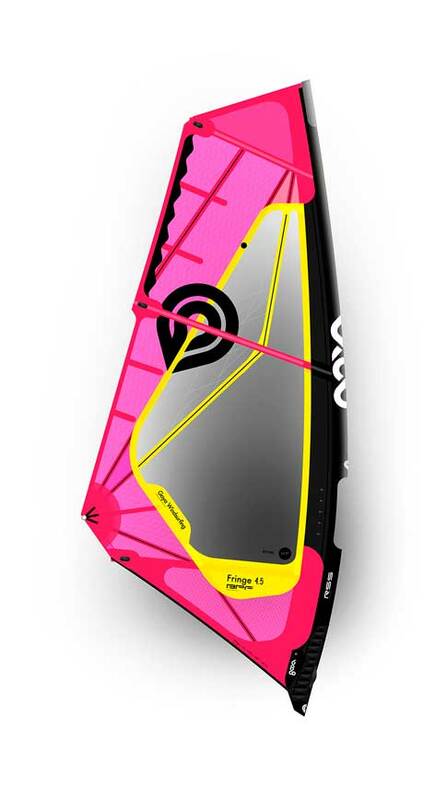 Fring, the best down the line sail I´ve tried. (And I have tried a few) Neutral when you need it, yet power to go where you want. 3.0 wind on Hatteras Island N.C.!!!! Hi Pascal! How are you? The Fringes are great! I love the way they work when bumping, looks like the sail is a huge heart beating! They are so light and have perfect instant power for the sideshore inconstant winds that I usually sail. They are also very good for freestyle, which was a nice surprise for me. My only concern is about their durability, I feel I have to be really careful about that big window. Some friends have tried my Fringe 5.0 and gone crazy! They are more used to sail with ezzy 4 and 5 battens, so they felt a huge difference when they got their hands on my sail! And now some happy customer words: When I bought my gear during my trip to Hawaii in 2013, I couldn't imagine that those new sails and board would be part of the most memorable moments of my life! During the following 3 years, I took them to Pacasmayo, Lobitos, One Eye and Manawa, got fantastic conditions on Rio's wave spots (Cabo Frio, Buzios and Massambaba) and had sessions in each of these places that made me feel so alive! I just can't forget one mast high swell on a glassy Manawa that made me feel so much freedom, happiness and sintony with nature on a way that I've never felt before. I really want to thank you guys for developing such nice windsurf gear that helped me enjoy the best years of my life. 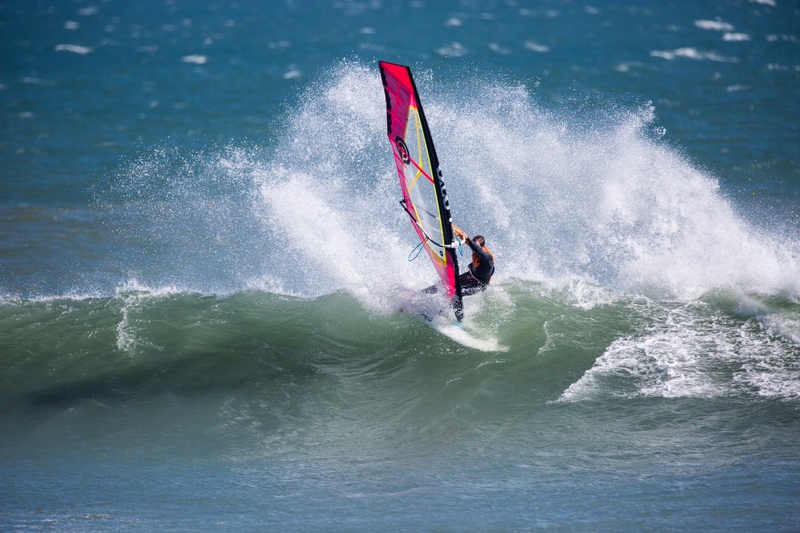 I think that Quatro and Goya are setting benchmarks and a direction to wave windsurfing that are allowing people to experience the best feelings windsurfing can bring even when the conditions are not the best and even when the rider is not that experient. You are allowing a lot of people to evolve on the sport they love and making their lives full of great moments! I owned a 5.3 - 2016 since 6 month, it's a dream sail. I love light Wind wave sailing but most important the overall lightness and power make the sail very lively , very subtle to feel small gusts in your hands.Super fun the sail but super efficient, 3 battens does not make significant changes to 4. Rigging and carrying your kit even in worst low tide beach distances is so easy, this makes windsurf off the wave a simple super easier life. Another point of view, is how Goya sails have just the right design to support the right sail engineering, the best of the less is more equation between appeal and function.Well done. Again and again Goya produce the best gear i ever sailed with. On my new board Goya custom quad 86 is the perfect combo anytime anywhere with 3.7 to 5.0. What else could i ask for ? 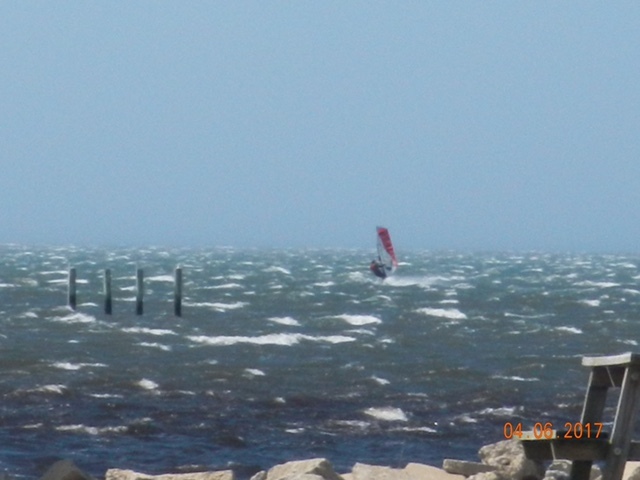 More wind and time on the water. Thanks all you guys ! Scored a great couple of days at Long Beach, Vancouver Island....this place hardly ever goes off wind-wise in a proper NW direction, I was lucky enough to be there! Day 1 was windier for 5.0 Guru with 12 secs but waves were smaller. Day 2 was 4-10’ late in the game, 8 secs and the Fringe came out!! The sail had the pump I needed to get through the glassy sections, allowed effortless and fine balanced punching out, disappeared on the wave when you wanted it to. Wind picked up to 27kn and I downhauled it and it hung in there. Built tough enough to take a beating so at this point I am glad I picked the monofilm not Xply. On a bigger day maybe that may change, haha, so far the ability to spot the surfers and read the waves is awesome. The sail looks amazing in photos too! Thanks Jason and Goya Team!! I find your 2016 sails awesome, each year they're geting better and nicer!